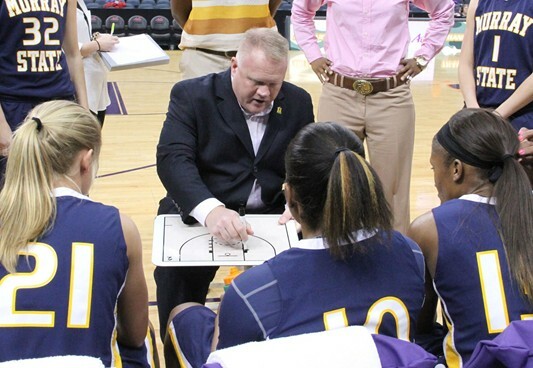 Murray State University head women's basketball coach Rob Cross is pleased to announce his roster for the 2014-15 season. "This is a team, that I believe, is built to compete for an OVC championship," said Cross. "We have great talent at all positions and will be led by three great seniors. With the addition of the two players who sat out last year, our players that are returning from injury and our five newcomers, I believe we have all the tools we need for a successful season." The 44th edition of the Racers in modern era of Murray State women's basketball will be led by seniors Keiona Kirby, Netanya Jackson and Chanyere Hosey. Kirby, who was averaging a team -high 19.5 points before suffering a season-ending injury, will look to return where she left off including shooting 40.3 percent from the floor. Jackson and Hosey will provide depth and leadership at the post position, as well as height, as Jackson stands 6-4 and Hosey stands 6-1. Jackson was named as OVC Newcomer of the Week three consecutive times over final three weeks of last season and averaged 11.0 points and 8.1 rebounds over that span. Hosey was also a key contributor for MSU last year, playing in each of the Racers' 28 contests. Also returning, will be three-point specialists sophomore Julia Fox and junior Bianca Babic. Fox averaged 7.6 point per game and shot 28.6 percent on 119 attempts from behind the arc before ending the season with an injury. Meanwhile, Babic shot 31.6 percent on 114 three-point shots and scored 5.6 points per game. In addition, due to her hard work last season, Andrea Dickerson has been moved from non-scholarship to scholarship status. Leading a corps of seven newcomers will be freshman Ke'Shunnan James and Western Kentucky transfer LeAsia Wright, who sat out last season due to NCAA regulations. James will bring both scoring and rebounding, while Wright will add even more to the Racers' shooting arsenal. Both are already very familiar with the Racer playbook as they practiced all season with the team last year and are ready and expected to make an immediate impact. Joining James and Wright will be five players new to Murray; Olivia Cunningham, Lexii Cassell, and Kyra Gulledge, as well as recent additions Jasmine Bonds and Ajee Smith. Cunningham helped lead Horn Lake to a Mississippi Class 6A title last season, while Cassell and her Holy Innocents team finished as runners-up in the Georgia Class A Private division. Bonds also ended her prep career in 2013-14 by earning her second consecutive All-Southwestern Conference honor at O'Fallon (Ill.) High School. Gulledge and Smith are junior college standouts from the Mid-South area, with Gulledge coming to MSU from East Mississippi Community College and Smith transferring from Southwest Tennessee Community College. Gulledge, a post player, averaged 9.0 points, 7.1 rebound and 1.2 blocks for the Tigers last season, while Smith, a guard, scored 12.0 points per game and shot 29.8 percent from the floor and 32.5 percent from 3-point range for the Salukis over 26 games. In addition to the roster, Cross also announced that sophomore Janssen Starks will not be returning to the team in order to focus on academics and that sophomore Taylor Porter is looking at others school closer to her home in the eastern portion of the Commonwealth. "I want to thank Murray State and Coach Cross for giving me the opportunity to live out my dream this past season," said Starks. "However, this year, I have grown a lot and realized that my priorities have changed and that basketball is not everything. While I love basketball and my Racer family, I have decided to step away from the game and focus on my career in nursing. The MSU nursing program is one of the tougher ones in the country and with the extensive time commitment that basketball requires, I want to be able to give my future career 100 percent. At the same time, I want Coach Cross and the rest of the team to have a teammate who is fully focused on basketball and unfortunately, that is something I cannot commit to right now. I want to wish MSU women's basketball the best of luck and there will be no bigger fan in the stands cheering them on than me." Porter echoed Starks' sentiments on Cross and Murray State in her own statement regarding her decision to look at other higher education institutions closer to her family. "While there might be those that do not understand, I have decided to explore my options as it relates to my future academic and athletic careers," said Porter. "Due to a family situation, I feel that this is something I need to do and that me being closer to home is what is best for me and my family. Racer Basketball and Coach Cross have been like family to me this past year and no matter what was going on in my life I knew I could always turn to him for guidance and encouragement. I appreciate everything Coach Cross and my teammates have done for me and my family during this very challenging time in our lives. I love him and my teammates very much and appreciate their understanding in this very difficult decision." "I fully support Janssen's and Taylor's decision," said Cross. "As the husband of an MSU nursing faculty member, I know how demanding that program can be. I support and commend her for her decision and know it is more important for her to focus on being a great nurse than a basketball player. She will always be a part of our team and we know that she we will continue to support her team and teammates, even though she is no longer playing. "Taylor's decision was a difficult one, but as some who loves her family very much, it was one she felt she needed to make. We have been and will continue to be there for her and her family through this trying time and only want what is best for her. Taylor will always be a part of the Racer family and should she decide to return to MSU next season, there will a spot on our team waiting for her."